I'm happy to introduce Lisa at Home to 4 Kiddos today! I first found her since she hosts Try a New Recipe Tuesday, and you're always sure to find something tasty there. I also love how she always gets her kids involved in whatever they're making and teaching them about making food. 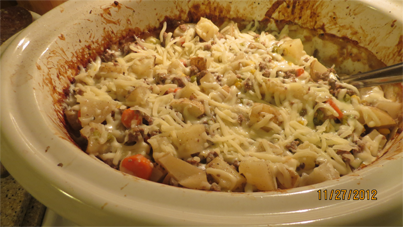 :) Without further ado, let's welcome Lisa as she shares her Beef Stew! A hearty beef stew with all your odds and ends - sure to please on a cold and blustery day. Today I’m sharing a recipe with you that I literally made up the other night as I went along. So, it doesn’t quite have a name yet. :) How’s "Lisa’s Beef Stew with whatever she had in the house" sound? Whatever you call it, it turned out to be a *big* hit in my house, and along with my homemade bread, was a perfect meal on a cold and blustery day. shredded cheese I used mozzarella because it is what I had in the house on a snowy day, but you could use whatever kind you like. 2 pounds ground beef, browned I had this already in the freezer which I highly recommend. Very convenient! 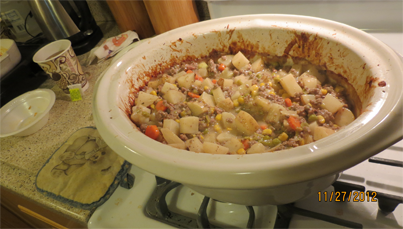 Put potatoes, beef, celery, carrots, corn, and peas in greased pan. Stir in soup and water. Sprinkle minced onion, Italian seasoning, garlic powder, and pepper on top and stir. Generously mix shredded cheese throughout. Use what you have left to sprinkle on top when it is done. Bake covered at 350F for about 1.5 hours, stirring every 30-45 minutes. Uncover for last 20 minutes or so.